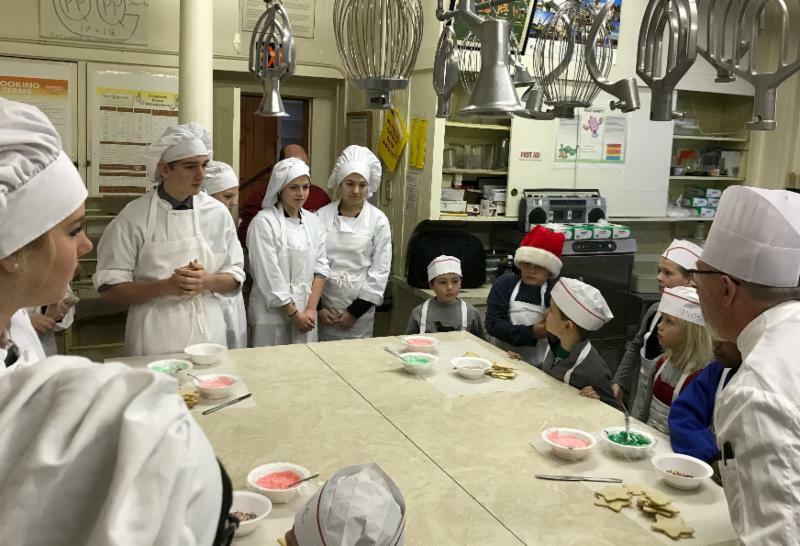 The 1st grade class visited SJA's culinary program last week to learn about and work with high school students decorating gingerbread cookies. Here is this week's Monday Memo, the last one of the first semester. 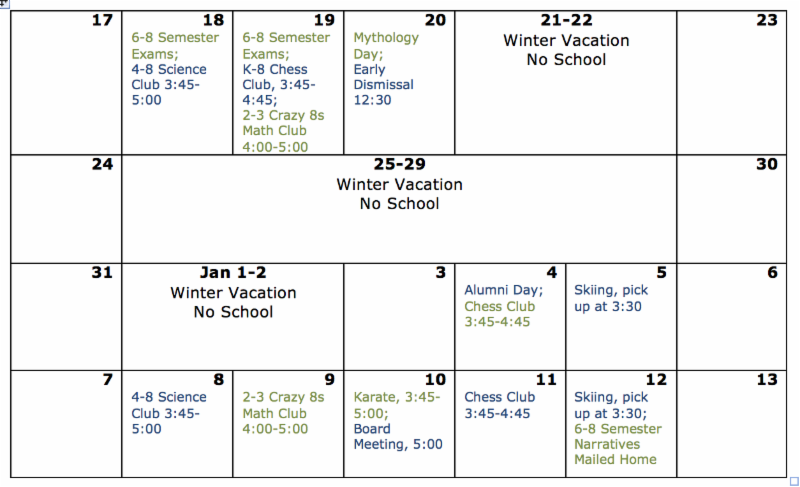 We are looking forward to a festive day on Wednesday, seeing parents for a 12:30 pick-up, and a happy holiday vacation. The faculty and staff are so grateful to the parents who are feeding us this week, what glorious, holiday generosity! There are few gifts that compare to knowing that we will be well fed during the school day. Who do you know? A skilled artist? Someone with vacation real estate? A corporate executive? Who would you be willing to ask to donate to Riverside? We are always looking for donations of valuable items that would appeal to a broad audience. Donations are tax-deductible and need to be confirmed with Krystal or Kim Rowell before January 24. And please don't forget to mark your calendars for the evening of Saturday, February 3 and to invite friends to join you for this fun evening at the library at Lyndon Institute. K-8th graders will spend Wednesday celebrating mythology - Note an early pick-up time at school at 12:30. We welcome parents to join us for any portion of the day that they can. At Home: K-8th grade students should be finding a wrapped gift ($5 or less) to share with another Riversider; 3-8th grade students should be preparing a costume and practicing a brief speech. 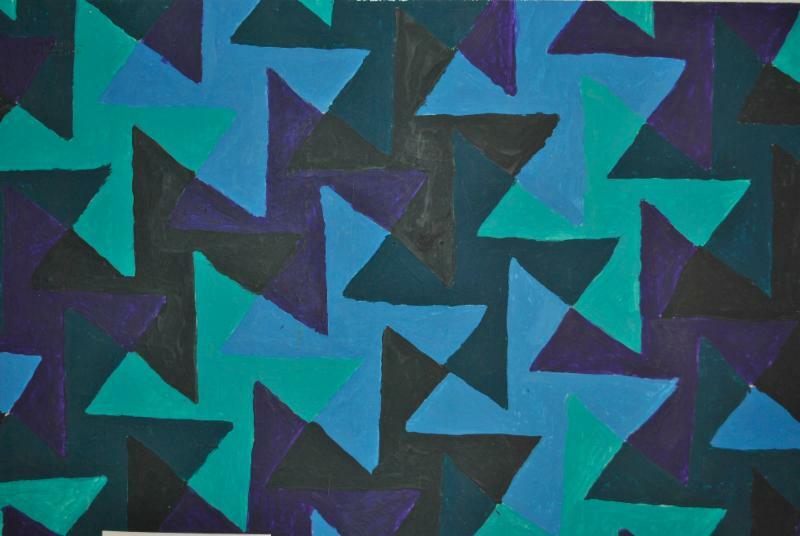 6-8th graders continue with semester exams and final creative projects on Monday and Tuesday this week. Please support them at home in getting organized and setting study priorities; focusing on beneficial study strategies; and managing stress. These are skills we really want them to practice before high school. Mr. G's Science Club for 4-8th graders will be meeting after school today until 5:00 pm. On Tuesday, December 19 at 1:00 pm in the barn, Peter's middle school drama elective will perform the show we’ve been working on this semester. Maaike, Liam, Aurora, and Jim Gilbert '16 will also be performing on their string instruments. Finished pieces from Suzanne and Rebecca's print making elective will be on display as well. Join us for this fun culmination of a lot of great work! Chess Club will meet on Tuesday from 3:45-4:45. Crazy 8s will be meeting on Tuesday from 4:00-5:00 in Lauren's classroom. This week you’ll make marshmallow catapults out of plastic spoons, popsicle sticks and rubber bands. Then you’ll try slingshots. See how the size of the fulcrum and your height off the floor can make your marshmallow the winner! Remember that donations to Riverside's Annual Fund are tax deductible, and so making one before December 31 will benefit you as well this year. We are so grateful for the community members who have already donated and look forward to achieving an impressive percentage of participation from Riverside families. It is not the size of your gift that matters as much as the act of giving, which helps us to demonstrate a strong and supportive Riverside community. DONATE ONLINE NOW. 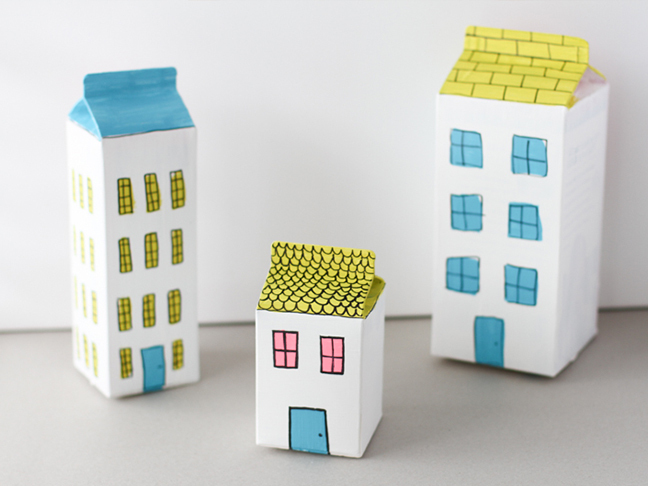 Students will be working to craft decorative "villages" out of cardboard cartons of all shapes and sizes as decorations for the auction. Please rinse out and send in any shape or size that you collect this week or over the vacation.